Nov 01, 2018 (LBO) – Ambassador Alaina B. Teplitz officially began her tenure as the U.S. 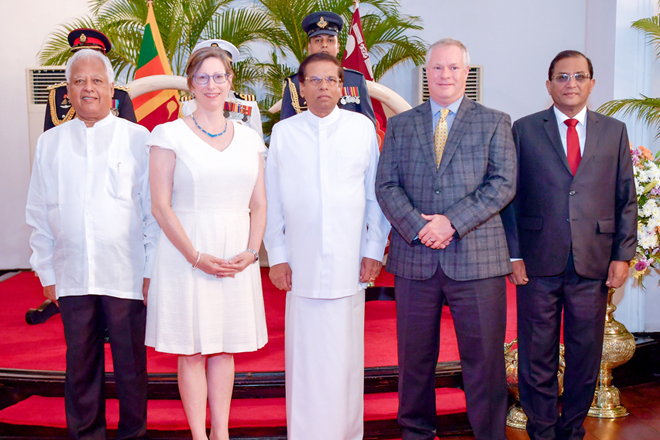 Ambassador to Sri Lanka today after presenting her credentials to President Maithripala Sirisena. The ceremony was held at the President’s official residence. Ambassador Teplitz was accompanied by her husband, Robert Saul. “I am honored to serve as the U.S. Ambassador to Sri Lanka at this critical moment for the country and region. For seven decades, the United States has supported Sri Lanka on its path to peace and prosperity,” She said. Ambassador Teplitz served as U.S. Ambassador to Nepal from 2015-2018. A career member of the Senior Foreign Service with the rank of Minister-Counselor, she joined the State Department in 1991. She was the Director of the Under Secretary for Management’s Office of Policy, Rightsizing, and Innovation (M/PRI) from 2012-2015, where she identified innovative ways to improve how the U.S. diplomatic service operates and championed efforts to enhance knowledge management, data use, and risk management. Prior to leading M/PRI, Ambassador Teplitz was the Minister Counselor for Management at U.S. Embassy Kabul from 2011-2012. She directed a team providing oversight for U.S. Government Chief of Mission civilian activities in Afghanistan and planned for the impact of the eventual military force reduction.